When I reviewed Gary Hoey's 2016 album Dust & Bones, the album was a real fast starter for me. I didn't have to spend a whole lot of time trying to decide what I liked from that album. It just struck a chord with me from the start. However, upon listening to Neon Highway Blues, I found that this review would be a bit more challenging. The songs weren't out of the box standouts to me upon first listen. Instead, I found the album to be more of a slow grower, with each successive spin of the disc giving me new insight and appreciation to the material and giving me a far better frame of mind in which to write about the album. 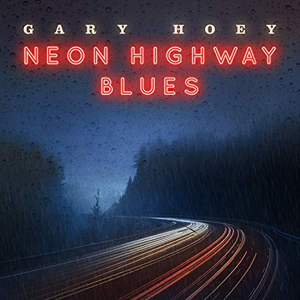 Despite his own continually refreshed reputation as a guitar gunslinger, Hoey also incorporates a number of guest appearances on Neon Highway Blues. The most impressive "get" might be Eric Gales, who appears on the album opening cut "Under The Rug". It should come as no surprise that the soloing throughout the disc is top notch, but with Gales and Hoey on the same song, it is like listening to a master class in guitar playing. The song has a great sound to it and Hoey's vocal styling gives it an invigorating lift. Not one to settle for the simple straight forward driving blues rock anthems, Hoey tones things down here and there. The album features three instrumentals. "Almost Heaven" had an interesting vibe to it. I liked "Waiting on the Sun" too, but thought the title track was a bit too slow and meandering for me to really get into it no matter how much I listened. The song "Mercy of Love" features Josh Smith on guitar and there's a more sedate pacing to the number with a smoky kind of barroom feel to the delivery. A man done wrong by his woman makes up the lyrical story for "Don't Come Crying". The playing here is really strong with a solo that is just powerfully alluring. Thematically, the next song "Still Believe In Love" seems to be something akin to the guy in "Don't Come Crying" still going onward. I admit that is probably more my read of things than any actual intention from Hoey himself. Still there's great swinging rhythm to the rocking little track. While blues drives the album, there's enough variety within the style that you can see something for just about anyone that might listen to the disc. "I Felt Alive" has a deep cinematic feel to it. As I listened to it, I could imagine it playing as a part of a movie or at the very least, the end credits of a film. Still, with all that I've said already, I still haven't highlighted two of the best songs on the album. "Living The Highlife" is just a killer rock track that gets into your head. As for "Damned If I Do", which features Lance Lopez on guitar, the song is a fiery burst of kinetic energy that gets your heart thumping and feet tapping. Yes, it might take you a bit more of an effort to get into this album, as it did with me. However, that effort is amply rewarded. The album is intricately appealing and only further enhances Hoey's reputation. Finding yourself speeding down this particular musical highway will make you roll down the windows and crank the music up loud.